Deep brain stimulation (DBS) is an effective, FDA approved treatment of Parkinson's Disease and other movement disorders. Successful outcomes require accurate localization of the target intra-operatively, and precise guidance of the electrode to that target. Direct magnetic resonance (MR) image guidance during DBS insertion would allow interventional MRI to be used for planning, monitoring of tissue deformation, real-time visualization of insertion, and confirmation of placement. The accuracy of standard stereotactic insertion is limited by registration errors and brain movement during surgery. Since the current standard of care entails planning probe placement with high-resolution MRI, it is a natural extension to perform the procedure directly in the MR scanner to ensure that the surgical plan is precisely implemented. With real-time acquisition of MR images during insertion, probe placement and insertion path can be confirmed intra-operatively. Currently, no technological solution exists to assist MRI-guided neurosurgical interventions in an accurate, simple, and economical manner. Use of a robotic assistant will minimize the potential for human error associated with the current procedure and will better address the practical issues of operating in an MR bore. The robotic system may also serve as a validation tool for researchers whose work requires precise targeting of anatomical regions identified by MR imaging for treatment such as drug delivery or tissue biopsy. 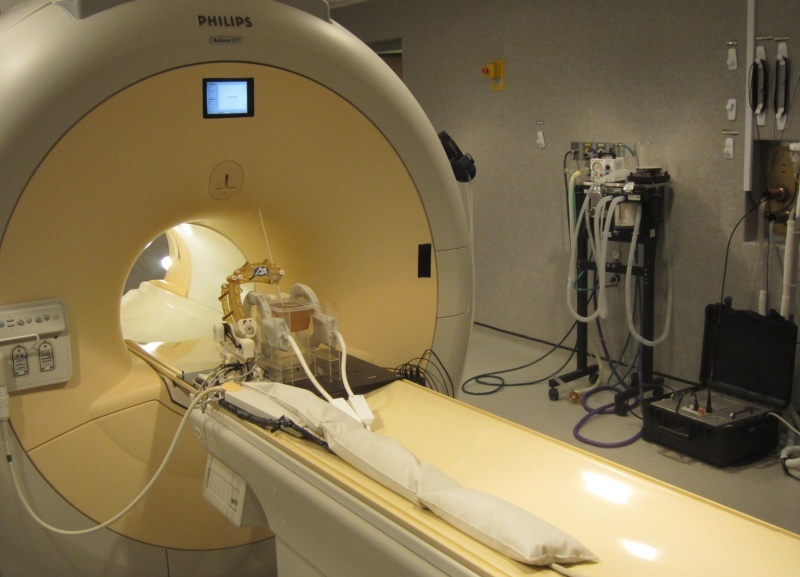 The objective of our research is to make conventional diagnostic closed high-field (1.5T - 3T) MRI scanners available for guiding DBS electrode placement interventions for treatment of Parkinson's Disease and other neurological disorders including severe depression and Alzheimer's Disease. This will be accomplished through the use of a robotic image-guided therapy system that offers significant improvements in deep brain stimulation, including reductions in surgical time and morbidity, over existing treatment methods. Pilitsis JG, Fischer GS, Burdette EC, Development of MRI-guided Robotic Hi-intensity Ultrasound Needle/Catheter for Ablation of Brain Metastases, Congress of Neurological Surgeons - CNS 2014, Boston, MA, USA, Oct. 2014. Pilitsis JG, Fischer GS, Cole GA, Stereotactic Neurosurgery with Real-time MRI-Guided Robot Assistance, American Society for Stereotactic and Functional Neurosurgery - ASSFN, June 2012.